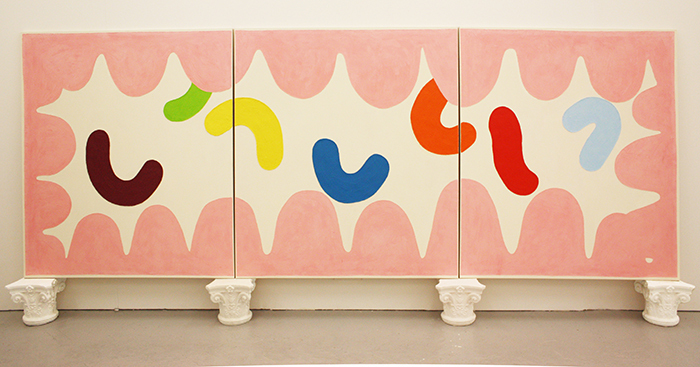 Camberwell Fine Art students Lewis Henderson, BA Painting, and Queenie Clarke, BA Drawing, have been nominated for the prestigious annual Woon Foundation Painting and Sculpture Prize this year, with an awards fund which totals £40,000 overall. This exciting competition is open to students in their final year of undergraduate study, offering the opportunity to show their work in a high profile group exhibition and possibly win one of three major prizes, funded by keen art collector Mr Wee Teng Woon. This year’s group exhibition will be shownat BALTIC 39 in Newcastle and Lewis and Queenie will be showing alongside ten other talented graduating artists from across the country. We caught up with Lewis and Queenie, who also won this year’s Vanguard Prize, to find out more about the prize and their degree show experience. Congratulations on being nominated for the prize – tell us how you feel about it. Is this the first time you’ve entered work in a competition? Lewis: Well, I feel surprised to be honest. I entered this prize ages ago and just forgot about it until they emailed me. It’s not the first competition I’ve entered, I went to Amsterdam for the Hans Brinker Prize in December too. Queenie: Thank you, I feel very excited for the chance to show work in a different part of England. It will be new to be in an exhibition with a group of young artists who are in the same position as me but coming from different universities – I’m really looking forward to seeing everybody’s work. Plus, I’ve never been to Newcastle before so that’ll be cool. It was the first time I’d entered a competition, but since then I’ve entered more. 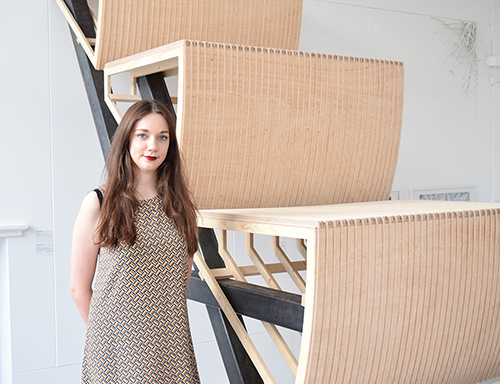 Tell us about your work in the degree show? Lewis: It plays with turning oil into plastic and, in turn, turning plastic into plaster, something that’s a familiar theme within my practice. But in the case of this piece of work, it’s put in the context of smoking clowns and Disney Land decadence. It’s a large oil painting stacked on plaster capitals split into three panels. 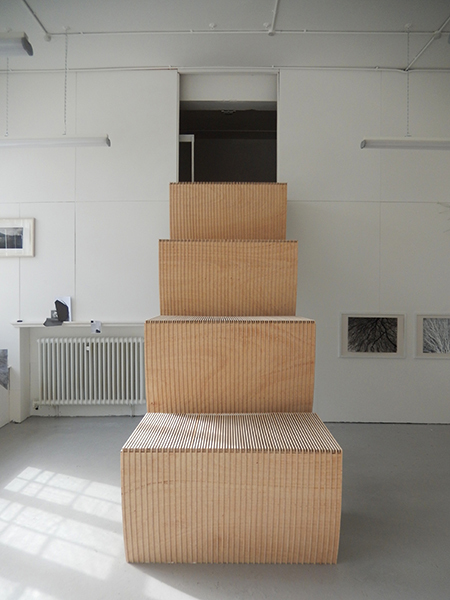 Queenie: The work I’m showing in the degree show is called Escalator 0.2. It’s comprises of four, static, large, wooden escalator steps. The steps are held up by a steel structure and are leading up to an empty storage room which is hard to see when standing on ground level. Viewers are confronted first with the structure as they walk into the room and then when face on, it appears to be a solid set of steps. I chose to make the scale of the steps much larger so it makes the viewer very aware of their size compared to this familiar machine. A transformation created through architectural engagement is a running theme throughout my work so I’m happy I was able to utilise the storage space to allude to a function. Looking back at your time at Camberwell, what is your favourite memory or best thing you have learnt during your degree? Lewis: My favourite memory? I don’t think I can choose one off the top of my head. I can say I enjoyed every day spent within the walls of the college. Camberwell was my home, now you’re throwing me out! Sadie Coles please adopt me. Queenie: My favourite memories are definitely when we’ve put on exhibitions and attending other peoples exhibitions. They’ve been a really good way for our courses to mix up, so we didn’t just stick with people in our fine art pathways. What advice would you offer students about to start their degrees at Camberwell in the autumn? Lewis: Challenge everything and don’t ever feel embarrassed to ask for help, you are here to learn. Queenie: Definitely use all the workshops as much as you can, even if it doesn’t benefit your practice directly. Don’t wait for the unit in second year (where you have a group external exhibition) to put on your own exhibitions outside of college. I remember thinking that it would be really difficult to have organised an exhibition, but it’s probably the best time because you have lots of people around you that are up for attending them and showing work with you. As you are about to graduate, what are your plans for the summer, and beyond? Lewis: Well, I’m going to be in a few shows, one at the BALTIC 39 for this award, a salon style hang show at Turps Gallery in July and two more lined up in London. You can find out more about these on my website. Queenie: I’m planning to carry on applying for competitions and residencies. I’m going to try and stay in London, so it’ll be juggling a job with making work. A couple of people in my class have chatted about how we need to keep the momentum going by having group crits and exhibitions, so that would be great. It would be ideal if a load of us could share a studio too. At some point in the future, I’d like to take part in projects abroad, especially if they’re architecturally led as collaborating with architects is something I’m really interested in doing too.